Laurie Lindstrand, our founder, created a venue in Camrose for auction clients and enthusiasts to buy & sell their assets by auction. 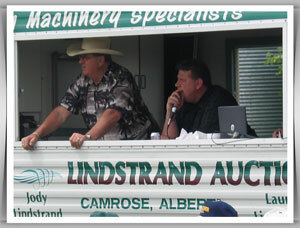 Since 1969, Lindstrand Auctions Ltd. has earned the experience and reputation of “The Farm Machinery Specialists” and have conducted over 3500 auctions. Today Laurie, along with son, Jody Lindstrand (President), maintain a full time Professional staff using the latest in computer technology, and a modern fleet of auction service equipment. Our auction services are mobile and ready to move, assuring you that wherever you need us, we are available for travel. We invite you to join our family of many satisfied auction clients. We look forward to serving you in the future!